Is there anything interesting happening out there? Density this, sustainability that, bla bla bla. Can any of you readers out point us to something fresh and inspiring? Summer laziness has set in, and I’m going to try a new approach: Why struggle to create original content when it’s so much easier to become part of the echo chamber? Just like Instapundit or Drudge. Posted by dan bertolet on	Sunday, August 3rd, 2008 at 11:02 am. You can follow any responses to this entry through the RSS 2.0 feed. You can leave a response, or trackback from your own site. Snap out of it Dan! The Internet is shining your bat signal on the clouds. Tell me why it is that people care more about taxing plastic bags than affordable housing. I work grocery and live six blocks away from work. A large number of my coworkers have families and can’t afford to live in the city so they drive between 30 and 100 (seriously) miles away so they can live cheaper. I make 40k a year and still need a roommate. The lack of affordable housing in Seattle is 1. bad for the environment, 2. bad for Seattle’s culture, 3. bad for traffic, 4. bad for the economy and 5. just plain stupid. How the hell did we get wrapped up in plastic bags? RBJ what’s your solution for affordable housing in Seattle? I don’t have a solution. I was merely positing a query and I also think Seattle is a great place to live. But you have to admit that people who make retail wages in the city of seattle have a problem making it here. Why is it whenever I ask that question people tell me to move? How about the issues joel connelly raised today in the P-I. Sound Transit, Market and Parks taxes all going before voters in the fall? to what extent does supporting these taxes help to create a “bigeasscity”? or does it undermine it when people leave for less-taxed locales. rbj – if someone is really driving to seattle from 100 miles away, encourage them to re-do the math. there are other options less expensive than that. I did do that with them. They see it as worth it. They have a beautiful house on an acre of land, plenty of room for their kids to run around in. Density shmensity. For a suburb-sized home and yard located in Seattle, I’d guess you would have to add $400k to the price of the home. At 200 mile round trip with $4/gal gas, a 30mpg car, insurance, etc. that’s about $14,000 a year. It would take 28 years to pay that back. Note: I started out this example trying to prove that math only gets you so far – at some point you have to be ok with a smaller house and yard. But even at nearly half a million dollars over the price of the suburban house this will pay back over the time frame of a 30-yr mortgage. This also means it more or less pays back immediately, since a house isn’t as much a cost as an investment – you can get more or less everything back out of it at any time. I guess you don’t have to settle for a smaller house in the city if you don’t want to. rbj, your example of your coworker is not a good one because he sounds like he is looking for affordable large lot housing, which is different than affordable urban housing. Affordable urban housing means downsizing, not waiting for developers to build giant homes and hand them out for next to nothing. It also doesn’t mean waiting for the City to require developers to do so. Though I think the City can play a role in the overall price of housing here, (give us some reliable transit so we can upzone) I am getting sick of hearing about affordable housing from the ranks of the middle class. There is plenty of affordable housing out there. Just don’t expect it to come with a huge yard and 4 bedrooms. America’s love affair with the single-family detached home is bad for the environment, not a lack of affordable mansions within city limits. Smaller housing is one type of solution but I’m not convinced it is affordable. I’ve seen many people build and remodel homes to fit Sarah Suzonka’s ideology and it wasn’t inexpensive. There are a lot of issues to deal with for affordable housing the first of which is where to draw the line in defining affordable? Everyone sees that line in different places but the only one that counts is the one the city decides to back with incentives. Right now that line is 120 to 85% median income. In my opinion that’s not where we need to be building it needs to be lower because that’s where we are headed economically (that’s only my opinion). The median income level we need to be building toward needs to be one projected in to the future and it needs to be conservative. Glorified transit (light rail) alone will not help. Living near a future light rail station and renting I am concerned that my rent will increase due to demand to live within walking distance of a L-rail station. True people need an easy and affordable way to enter the city from more affordable neighborhoods but right now the light rail only takes people to the airport and downtown. That’s not doing much more than some of the express buses. With the long construction times light rail needs it should not be considered a “silver bullet”. I agree that affordable housing will come from living closer to our neighbors and in clusters because it is less expensive to build when it can be done in large quantities where builders can obtain lower supply costs for materials to construct and goods to furnish. We can not assume that most developers will build to minimize their profits and for public service. What is going to crush our housing supply is if our assumptions about what part of median income people will be living at when the need is met are to high. Then the people we thought we were building for no longer can afford the housing. In my opinion, we also have to take the negative stigma off renting and dispel the notion of the “American Dream” of home ownership. The bank bust going on right now should be one indication that some people should not be owning homes (I am not making a comment on someone’s personal choice to sign on to a bad mortgage). Given a fixed location, you have exactly 2 variables to work with in order to change a location’s affordability: size and cost of construction. There have been good debates about how to affect the cost of construction, but the size variable is one that people seem to have a hard time with. Why is size a big deal? Because if you have the choice of building a house or 10 condos on the same lot, the land value of the condos will each be 1/10 of that of the house. You just can’t get that kind of value out of cutting corners on construction cost. Oops, I missed the third variable: number of stories. 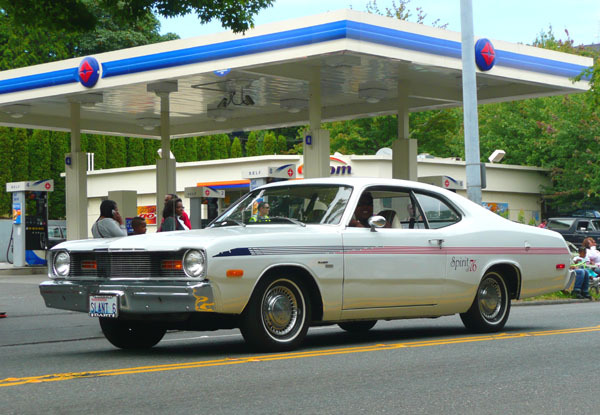 Are none of you going to comment on the Spirit of 76 Dodge Dart? Nothing about the irony of the all-American, bicentennial edition, red, white, and blue slant-6 classic in front of the red, white, and blue gas station selling gas at $4/gallon? Very true Spencer, all smaller housing are not created equal. And unfortunately, developers have been way too keen on building condos starting at $500,000…starting?!?! Good thing is, the luxury condo market has been overbuilt and the rental market is on the ups. Housing markets are complex, and a good example is that I forgot another good way the City can influence housing prices: use incentives to keep all the follow-the-buck developers from mindlessly overbuilding the same market because it happens to be a good one at that moment. We could have been offering incentives to build midrise rentals instead of another brix, metropolitan, [insert creative modern urban buiding name here]. Thank you for waking me from another one of my oversimplifications. Size is certainly a factor in affordable housing, but primarily for singles, or early couples. When you start raising a family, it becomes increasingly difficult to make that 500 sf condo work. And the downtown isn’t built for families yet. I agree with Wes – the best way to make affordable housing happen is to incentivize it. They just passed a new MFTE program aimed at doing that, but it’s limited. There are two major things the city could do to facilitate this: create a “fast track” zoning system, ideally performance based, that prioritizes certain types of projects. Allowing a developer to shave off 3-6 months from the entitlement process saves a lot of money and helps certain types of projects pencil. Second, grant TIF authority to cities and enable a more empowered public development authority that has the access to federal and state funds to enable this type of thing to happen. Actually, this last one is a state task, but unfortunately we have a speaker who refuses to even look at TIF legislation. I think he has good intentions, but the reality is that if we want to empower cities to fully shape their future, Chopp’s gotta go. As an aside – I don’t think anyone would argue that plastic bags are more important than housing. But waste is an issue, too, and passing that legislation is a good political step for a lot of reasons. And, Dan: love the picture, and the irony. Joshua, what are the developers doing that make these units “affordable”? Selling them for less? Unless they’re smaller or lower quality than other units, this is just a windfall for the first buyers that show up – they certainly won’t sell for under market value. I assume you’re asking about the MFTE. The way it works, and this is rental I’m referring to, 20% of the units are priced to be affordable to those making 80% of the area’s median income (or 90% for two bedrooms). In exchange for maintaining this 20% “affordable” developers receive a property tax exemption for 12 years. I’m not as familiar with the homeownership component of MFTE, but I believe it gives buyers that fall into slightly higher median income categories property tax exemptions for 8 years, allowing them to afford more (but, to your point, doesn’t incent developers to lower prices). I think MFTE is better for rental. To the larger point, though, it’s a small tool in what should be a larger toolbox to help provide affordable housing for both renters and homeowners. Maybe you could make changes to the page name title Lazy and Uninspired | hugeasscity to more better for your blog post you make. I loved the blog post yet.